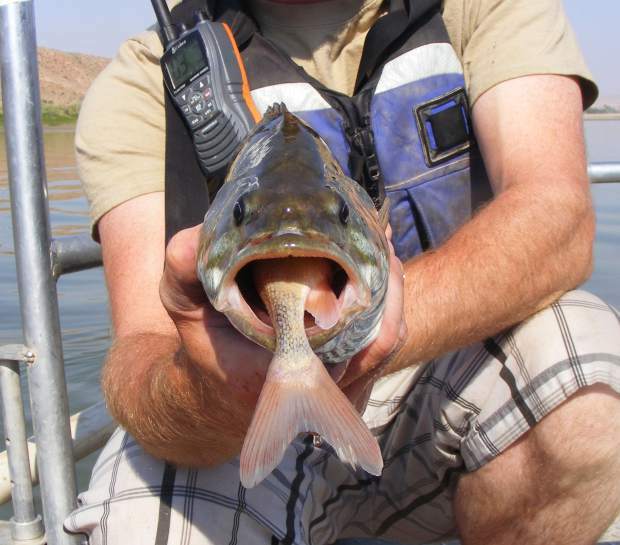 A non-native smallmouth bass on the Green River, caught with a native bluehead sucker in its mouth. The biggest threat to native endangered fish are non-native predators, especially the smallmouth bass. Federal officials told regional water managers last week not to plan on coordinated reservoir releases this spring to help endangered fish in the Colorado River near Grand Junction as there’s likely not going to be enough water. “It’s difficult for me to find the water in my forecast,” said Victor Lee, a hydraulic engineer with the Bureau of Reclamation during a conference call March 27 with regional water managers. For the past three years, 29,400 to 35,700 acre-feet of “surplus” water has been released out of various combinations of Ruedi, Wolford, Williams Fork, Green Mountain, Homestake, Willow Creek and Granby reservoirs to bolster spring flows. The water is released in early June to help maintain critical habitat in a 15-mile stretch of the Colorado River between Palisade and Grand Junction, above the river’s confluence with the Gunnison River. Big peak flows clean the cobble on the river bottom where endangered fish lay their eggs. And the high flows frustrate non-native fish species that prey on young native fish, a major obstacle to growing the endangered fish populations. The coordinated release of reservoir water is meant to offset the immediate impact of two large water diversion structures with senior water rights at the top of the 15-mile reach that send irrigation water to the Grand Valley. It also offsets the extensive series of transmountain diversions that occur at the top of the system for Front Range use, and the irrigation diversions from the river system on the Western Slope. Keeping the endangered fish populations stable matters to regional water managers because it allows current and future water uses to occur. If the fish populations continue to decline, the rules in the Endangered Species Act could produce a much different regulatory climate. To avoid that, water managers work together through the Upper Colorado River Endangered Fish Recovery Program, which is managed by personnel at the U.S. Fish and Wildlife Service. The coordinated releases of water from upstream reservoirs in the spring are part of the effort. Last year the effort increased the peak flow in the 15-mile reach from more than 12,000 cubic feet per second to over 14,000 on about June 10. The coordinated releases from the reservoirs have happened in 10 out of 20 years since 1997. In wet years such as 2011, spring flows are judged to be high enough. And in low years, as this one is expected to be, it can be hard for water managers to find water to spare for the endangered fish. Last year, as part of the spring release program, Ruedi Reservoir sent 4,501 acre-feet into the lower Fryingpan River toward the 15-mile reach, causing flows to rise June 2 from 200 CFS to 600 on June 7, before stepping back down to 200 by June 14. Miller’s March 1 forecast this year showed a water-supply forecast, which is based on snowpack, of 69 percent in the upper Fryingpan River basin above the reservoir. And like other regional water managers, he doesn’t expect this week’s forecast to look any better. Miller still expects to fill up the 100,000 acre-foot Ruedi Reservoir by early July as usual, there’s not much “wiggle room” in the forecast, or the snowpack. A slow-fill of Ruedi means the Fryingpan below the reservoir also will see a low and steady flow of water — probably not more than 150 CFS and perhaps less — from May 1 until late July or early August, when late summer releases begin, Miller said. Other reservoir managers in the upper Colorado River basin are facing similar challenges, and Don Anderson, the instream flow coordinator for the endangered fish recovery program, understands they don’t have “fish water” to release every spring. “It’s an operational call that they make based on their comfort level of either bypassing or releasing inflows with the confidence that they are not jeopardizing their storage conditions later in the season,” Anderson said. The coordinated high spring releases are meant to benefit four species of endangered fish that still eek out a living in the Colorado River between Rifle and Westwater Canyon. The humpback chub and Colorado pikeminnow populations are still wild, while the bonytail and razorback sucker populations are stocked. At the core of that recommendation was the relatively stable population of about 12,000 adult humpback chub that live in the Little Colorado River in the Grand Canyon, where the muscular torpedo-shaped fish evolved 3-5 million years ago. There also are about 400 adult humpback chubs living in the Black Rocks section of the Colorado River, just west of Loma. And there are another 2,000 to 3,500 adults in Westwater Canyon just over the state line. Both population groups appear relatively stable, but their future is uncertain. A similar population group in the Yampa River, last seen in 2004, is now considered “extirpated,” meaning eliminated. The biggest challenges for the remaining humpback chubs are lack of adequate stream flow and the spread of non-native predatory fish. Regional water managers like Miller at Ruedi Reservoir also work together in late summer to release water to boost low flows in the 15-mile reach. Last year, 79,000 acre-feet of late-season fish water was released from participating reservoirs. The water kept the river closer to the targeted-flow of 1,240 CFS instead of the 500-CFS-levels it was dropping to in August. Of that 79,000 acre-feet released from the reservoirs last year for late-season flows in the 15-mile reach, Ruedi contributed 21,413 acre-feet of water, sending it downstream between Aug. 7 and Oct. 16. But it’s expected that there will be less late-season fish water this year, both out of Ruedi and in general. On last week’s conference call, officials with the fish recovery program said they intend to set a low-flow target of just 810 cubic feet per second for late summer flows in the 15-mile reach, instead of last year’s target of 1,240. The decision could change if spring snows come. But if the low-flow target is definitively set this year as expected, it will be the first time since 2012. “It’s just looking at what’s really going to be feasibly achievable given the actual wet water we have to work with,” Anderson said. And even the low-flow target of 810 CFS could be hard to hit this year. “We can’t always get there sometimes with the water that is available, but we can at least do the best we can to close that gap,” he said. Aspen Journalism is collaborating on coverage of rivers and water with The Aspen Times. More at AspenJournalism.org.